That was 1968. In the constellation of super groups of that era, none shone more brightly than the Temptations. Edwards was the first new member to join the Temptations – the “sixth Tempt” – and led the group’s transformation from love songs to the psychedelic soul sound – and led Motown Records to its first Grammy Award with "Cloud Nine." With the rugged good looks to match his voice, Edwards became steeped in the majesty, legend and drama that was the storied musical franchise called the Temptations. After a career that spanned more than five decades, Edwards, who had made his home in the St. Louis area since the 1970s, died last night — just one day before his 75th birthday. Several media outlets reported that he was in Chicago at the time of his death. The Temptations, the successful combination of Ruffin, Eddie Kendricks, Paul Williams, Melvin Franklin and Otis Williams, were dubbed the “Classic Five.” But as the sixth man – and one of the most memorable and beloved voices – Edwards would be treated like an original. In 2013, he was included in the Grammy’s Lifetime Achievement Award given to the Temptations. As he was preparing to leave to accept the award, he told the St. Louis Post-Dispatch that he was humbled. Edwards made it by sheer talent – and unwavering confidence. He began singing in his father’s Alabama church when he was a toddler. The family moved to Detroit when Edwards was in grade school. There he continued to sing in a church where his father was pastor, eventually becoming choir director. As a teenager, he attended the Detroit Conservatory of Music. Before the mighty Temptations, there were the Mighty Clouds of Joy. He sang with the gospel group and liberally borrowed the stylings of its lead singer, Joe Ligon. Like Ligon, his strong baritone, a tangle of steel wool and cashmere, was often punctuated with barely controlled wails of joy or anguish. It was the perfect voice for a group named Dennis Edwards and the Fireballs, which he formed in 1961, over the objections of his very religious mother. The Fireballs quickly recorded a single on the International Soulville Records label titled "I Didn't Have to (But I Did)," with "Johnnie on the Spot"on the flip side. His nascent recording career was quickly interrupted by Army service. While stationed in Dachau, Germany, where one of the largest Nazi concentration camps had been located, a friend sent him the single, "My Girl." He knew after he was discharged, he’d go home to Detroit and straight to Motown Records. In 1966, he headed to Hitsville USA, as Berry Gordy’s studio was nicknamed. He was assigned to the Contours after the group’s lead singer became ill. The following year, the Contours opened several times for the Temptations, by now a successful recording group with a burgeoning portfolio of hits, including "Ain’t Too Proud to Beg," "I Wish It Would Rain," "Since I Lost My Baby" and "(I Know) I’m Losing You." David Ruffin, with whom Edwards had become close friends, was about to lose his demand for top billing in the group and was slowly losing his bearings to cocaine. After failing to show up for an engagement on June 27, 1968, Ruffin was fired; the next day, Edwards was hired. He said it did not affect his friendship with Ruffin, who had alerted him – around 4 a.m. – about the imminent invitation. Ruffin continued to show up at concerts, and often stole the microphone and the show. Edwards disputed the contentious scene in the 1998 TV miniseries, "The Temptations," where he was played by Charles Ley. He insisted that he cooperated in his own upstaging at concerts. “ 'My Girl' was always the last song of the show and David would come down out of the audience and sing it,” he told the Asheville (North Carolina) Daily Planet in 2012, “and the others guys (in the group) would get so mad” at both of them. His biggest concern when he joined the group was mastering the intricate choreography – and that signature Temptation Walk. He quickly learned that it wasn’t as difficult as it appeared; it was all about timing and practice. Right out of the gate, Edwards delivered the goods. He spent the next nine years helping to make the Temptations one of the most successful groups in the world. He led the Temptations into its social consciousness season with a new, psychedelic soul sound and Motown to its first Grammy with the group’s classic "Cloud Nine" in 1968. He led "Papa Was a Rolling Stone," which netted the group three Grammys in 1972. Edwards attributed the power of the song to having recorded it in anger and grief; his father had just died and he visualized the song differently than the producer. He angrily capitulated to the wishes of Norman Whitfield, who produced most of the group’s hits. He preferred the production style of his friend Smokey Robinson, who wrote many of the Temptations’ early songs. He later grudgingly admitted that Whitfield, with whom he was often at loggerheads, was right that time. His lead of songs like "Runaway Child, Running Wild," "Psychedelic Shack," "Masterpiece" and "Ball of Confusion," helped cement the group’s funk and rock credentials. Despite his star power, Edwards was hired and fired by the Temptations three times. It was always about money, he said. He first left in 1977, when the group moved from Motown to the Atlantic label. He returned in 1979 when they rejoined Motown and was part of the 1982 reunion tour. The reunion album spawned the chart-topping single, "Standing on the Top," written and produced by Rick James, who also shared lead vocals with Ruffin, Kendricks and Edwards. He left the group again in 1983, when Motown gave him a real shot as a solo artist. In 1984, he scored not a solo, but one of the all-time great duets, "Don’t Look Any Further," with Siedah Garrett. He followed it up with the equally sensual "(You're My) Aphrodisiac," which became a top 20 R&B single. He recorded "Coolin’ Out," which may have foreshadowed the cooling of his solo career. He returned to the Temptations in 1987, before making his final exit in 1989, the year he was inducted along with original Temptations into the Rock and Roll Hall of Fame. Edwards briefly teamed with former Temptations David Ruffin and Eddie Kendricks in Ruffin/Kendricks/Edwards, but the trio had no releases. He later formed The Temptations Review with Dennis Edwards, which started a fight over use of the Temptations’ name with Otis Williams, the last original Tempt. The two spent years and hundreds of thousands of dollars in the fight. Against the advice of their attorneys, after a chance encounter, the two old friends decided to settle the name issue then and there. And they did. “Our attorneys cussed us out,” Edwards said. Until shortly before his death, Edwards continued to tour with his Temptations Review, singing the songs that generations had grown to love. Edwards was born Feb. 3, 1943, in Fairfield, Alabama, near Birmingham, the son of the Rev. 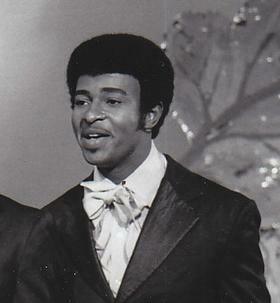 Dennis Edwards Sr., a former honky-tonk piano player. His father gave up show business for the ministry and moved the family to Detroit when he found a job at Chrysler. By his own admission, he had not lived a pristine life, but he outlived four of the five original members of the Temptations, all of whom died before their 53rd birthday. His mother didn’t just pray, she took action. She had moved to St. Louis and her son was living in Hollywood. During the ’70s, she decided that Edwards needed a lifestyle change. She told him she was dying. His mother had long ago stopped thinking of Edwards as “her son who turned his back on the Lord.” A few years after the Temptations rocketed to the top, Edwards left a thousand dollars on his mother’s fireplace because she wouldn’t accept it. He said she called him and said she hoped the Lord didn’t mind her using the thousand dollars to pay bills. He assured her the Lord wouldn’t mind. When his mother actually became ill shortly after she’d tricked him into a visit, he moved to St. Louis to be with her. He never left, later declaring that St. Louis was the best thing that ever happened to him. Survivors include Issa Pointer, a daughter from his marriage to Ruth Pointer of the Pointer Sisters, and Denise Edwards, a daughter with his former wife Brenda Edwards.